Intake Valve, 2.080'' x 4.903'' o.a.l. Exhaust Valve, 1.600'' x 4.955'' o.a.l. Head Torque w/Moly Lube 65-70 Ft. Lbs. Rocker Stud Torque 55 Ft. Lbs. Intake Port Gasket AFR 033-6860 - DO NOT PORT MATCH Intake Manifold to Fel-Pro Gasket. Spring Pocket can be cut to 1.625, no deeper. The AFR Emissions Legal (CARB EO #D-250-2 for engines up to 1994), 195cc intake port LT4 small block Chevy aluminum cylinder heads are available in an LT4 angle plug version. These heads feature a 58cc combustion chamber (can be special ordered 55 to 65cc) with a 64cc exhaust port and a 3/4'' thick head deck (ideal for nitrous or blower applications). 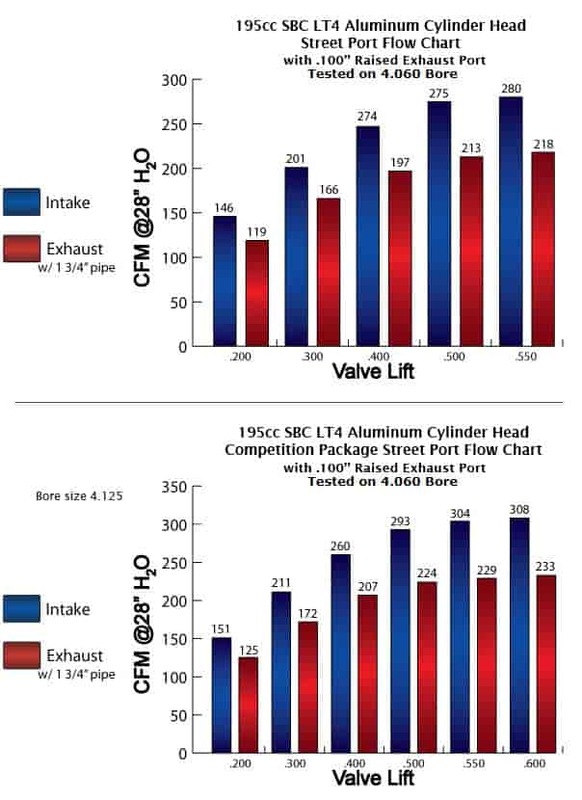 Standard valves are lightweight 8mm diameter stem, 2.020'' intake and 1.600'' exhaust valves with AFR's hardened ductile iron interlocking valve seats. The exceptional flow characteristics, ideal operating range of 2500 rpm to 6500 rpm (higher rpm ranges possible depending on combination of parts), 23° valve angle, and standard valve spacing make this the perfect street head for 350-383 ci engines. Designed specifically for 1996 Corvettes or LT4 manifold users. No special parts are required. Dual valve cover bolt pattern is standard. Exhaust port and bolt pattern are raised .100'' (3/32'') over GM L98 cylinder heads, this rarely affects header or chassis fitment. Made in USA. Installation Note: Hydraulic roller cams typically experience valve float at 6200-6400 rpm because of their fast ramp rates. AFR suggest you upgrade your springs to AFR part number 033-8605, 1.270'' O.D. with higher spring pressures and use our Patented ''Hydra Rev Kit'' to reduce chances of valve float associated with rpm 6200 or higher.